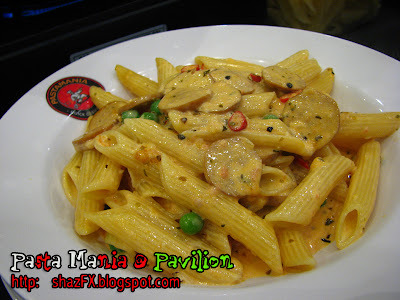 Pastamania, Singapore's chain of restaurant serving GREAT Italian Cuisine at affordable prices! Yes you heard me right... What's the FIRST thing that comes up in your mind when you hear "ITALIAN FOOD"... YES! You got that right... "Pricey..."... mwhahaha!!! 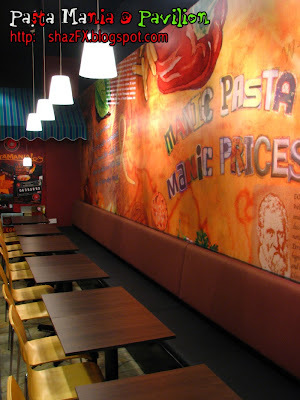 Well, all of that has changed ever since Pastamania opened their first outlet in Malaysia right here in Pavilion! Second outlet is in Gurney Plaza Penang and the third coming up soon at Bukit Tinggi Jusco. Have your lunch here at Pastamania with prices as low as RM6.90 and my favourite pasta here at Pastamania is tha Bacon Aglio (Turkey Bacon) which is running at RM12.90 - and you can upsize your pasta - add an additional RM3.50 (if i am not mistaken)... and there's this "OPENING SPECIAL PROMOTION" where if you get any pasta and buy a drink together with it - you'll get free a bowl of the soup of the day and garlic bread. Yes...it's actually a lil' bit cheaper than the mamak that i used to go to last time in Tmn. Megah near the old LimKokWing! Pastamania's stand is "We aim to make good quality Italian food conveniently available at prices readily affordable to most people." 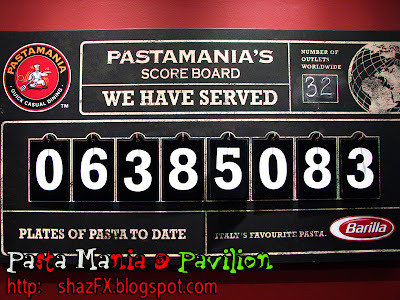 - Anyways, today was the 2nd consecutive day that i had my lunch at Pastamania Pavilion, but i was in a rush! And they served my meal in a jiff!!! That was fast... anyways the meal that i had was very satisfying, the cream of chicken soup had REAL chicken chunks in 'em... the garlic bread was ok - the pasta that i had was AWESOME! 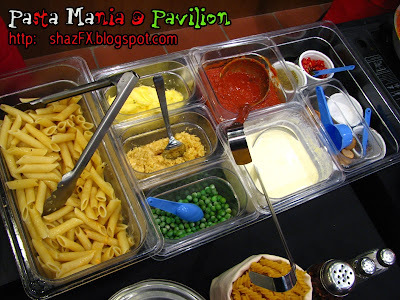 Make your way there to Pastamania today, you can reserve tables there! 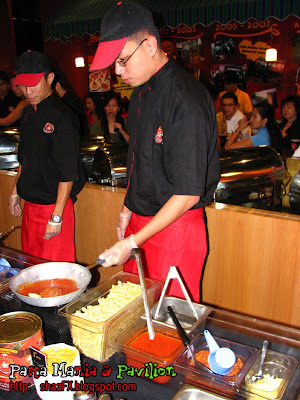 For more info about Pastamania, more updates about this restaurant coming up soon! 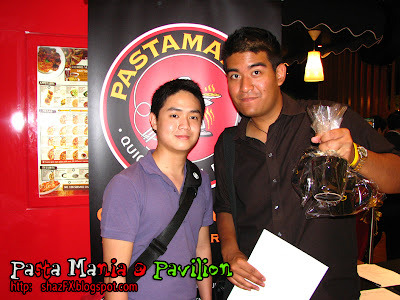 But for now let's look at my awesome morning / lunch at Pastamania Pavilion last thursday for their official grand launching! Was invited by my confreres at RantauPR to cover this launch and enjoy the FOOOODD!!! Here's the group of Pastamania's chef's and partners together with 2 members of the media at the entrance of Pavilion and the bikers!!! 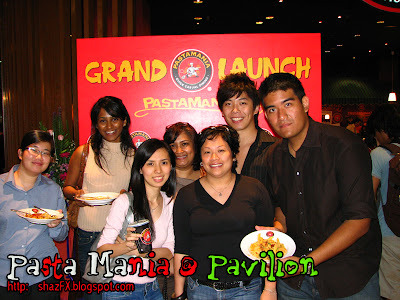 The grand launch of Pastamania attended by many members of the press, invited guests and best of all great company of my friends from RantauPR and Richard from Spotlite magazine. (L-R: Joanne, Subashni, JC, Jualia, Adeline, Richard andShaz...). 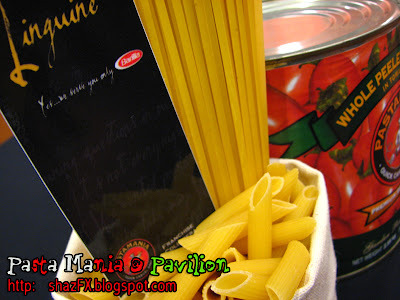 Pastamania only uses the best ingredients from all over the world... all for you!!! Wahhh look at the scoreboard! Is this real??? I'm sure it is!!! Time to have a look at how appetizing the pasta is!!! Unfortunately i am not able to take a nice photo on this day due to lighting and other circumstances! 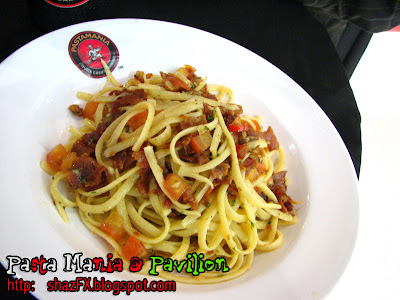 - btw this is my favourite Bacon Aglio fettucini! Here's a mixture of the cream sauce and tomato sauce pasta with chicken sausage!!! During the launch of the Pastamania here at the Pavilion... there was a "Malaysian" version of the STOMP performance... using all these local materials to produce great sound! The high commissioner of Singapore Mr Jasudasen officiating the grand launching of Pastamania here at the Pavilion. By the way Mr. Jasudasen is actually my schoolmate's father... Andrew, Claire and Diana Jasudasen way back in school @ the British School of Paris. There were also 4 chefs of Pastamania all the way from Singapore that came by to do a cooking demonstration for the members of the media and cookout!!! The food are AWESOME! Some of the ingredients used to make the pasta for the on-site cooking demonstration on this day! By the way... one night after my shift at the studio! I had supper with Kingsley at McD! 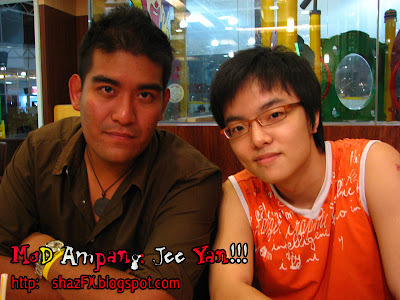 And here's Jee Yan! Look at our tired faces... too early in the morning la!!! Mwhahaa.. Here at PastaMania, we work closely with many excellent brands, using only the very best ingredients found all over the world, to create that famous 'PastaMania' experience you love so much. Our purchasing team toils relentlessly, seeking and negotiating with various suppliers and producers from a multitude of countries, often having to speak in different languages to find ingredients that match up to what we call the ‘PastaMania Standard’. Our Research and Development team then takes over; first testing and assessing the product, ensuring it is of sufficient quality before the recipe is produced. Then experimenting with alternative recipes, trying out and put to trial to a panel of Food Testers and Critics over and over again, before the final recipe is decided. Finally, streamlining and developing the work process for that particular product, and put to trial once again, before it is presented to our precious customers. So, you see, more often than not, only Brands that are widely recognized to be of quality can possibly survive this series of arduous and demanding tests. And people often wonder why we smile with such pride when we see our customers enjoying our food.